Camping at Lake Tahoe isn’t exactly what most people expect. Those who’ve never been there think of getting to pitch their own tent near the water, but that isn’t the case. You can, however, get something that’s close to that experience. All of the Lake Tahoe campgrounds are found on the south and west parts of the lake. Some of them are run by the California State Park while the others are run by the US Forest Services. There are those that are privately owned as well. You can get a good bird’s eye view of what the grounds look like if you look it up on Google Maps. These campgrounds have to be reserved prior to use. If ever you happen to be making these reservations at only a few weeks or days’ notice, then you’ll want to start with the ones that are privately owned before checking out the ones run by the national forest. The following list is a result of a poll from more than 6,300 campers who have experienced camping at Lake Tahoe before. Just across the street by the Zephyr Cove Resort is a privately owned campsite on the east side of the Lake. None of these sites are adjacent to the lake, but there are those that offer some nice views of the lake itself. Its RV sites can accommodate vehicles that are up to 40 feet long, and there are about 90 sites in total and come with access to water and cable TV hookups as well as a sewer. There are also some tent sites that are within walking or driving distance. If you want to do laundry or take a shower, you can head on to the resort. Reservations can be made online via the Zephyr Cove’s website. Nevada Beach is located within a national forest and is therefore under the US Forest Service. This one’s a pine forest located 6,100 feet above ground. There are campsites for both tents and RVs, most of which offer views of the lake. They campsites have flush toilets but they don’t have any hookups. The campground is quite close to the lake shore, which you can access by walking. If you have pets, you can bring them too, since the site allows up to two pets per site. You can’t however, take them to the beaches with you. The Nevada Beach website lets people make reservations online, but you have to make sure that whoever makes the reservation is going to be there, since the reservation holders have to check in personally. If you have extra vehicles with you, you’ll have to pay an extra fee. Here’s another privately owned campsite. This one’s about five miles south of the Lake and nine miles away from Stateline casinos. The Lake Tahoe KOA has its own RV parks and campsites, with some having electricity and water hookups while others don’t. You can bring your pets here for an extra fee. Reservations can be made via the Lake Tahoe KOA website. Fallen Leaf is located within a national forest. It’s a pine forest that offers no lake views, but is nearby Fallen Leaf Lake which people can walk to. The good thing about this site is that it has 206 spots for RVs and tents as well as six yurts or tent cabins. They features coin-operated showers, restrooms, water spigots, and flush toilets. The place is open between the middle of May until the middle of October. You can make reservations via the Fallen Leaf Campground website. Found within the California State Park, Emerald Bay State Park was closed in 2015 but is set to reopen on June 2018. It is located 12 miles south of Lake Tahoe. The park features a boat-in campsite that opens during the summer. To know which parts of the park have reopened, you’ll have to visit the official website, which is also where you’ll make reservations anyway. Part of the California State Park, the D.L. Bliss State Park features 150 campsites for families and is just walking distance from the lake’s shore. The place is really close to a lot of hiking trails as well. The place also has a number of campsites for RVs of up to 18 feet and trailers that are up to 15 feet. They have restrooms and showers. Dogs are allowed within the campgrounds, paved roads, and picnic areas only and they must be leashed. They’re not allowed to go to the beach or anywhere else. D.L. Bliss closes up during the winter. If you’re out of luck, you can try the Sugar Pine Point Campground that’s nearby. Meeks Bay resort is privately owned and features lodges and cabins that are perfect for groups who want to enjoy a bit of camping but still have access to the comforts of home. The resort has its own restaurant and the campsites come complete with hookups as well as picnic tables and places to pitch tents. You can’t bring your pets here, though. Meeks Bay resort closes down during winter season, but you can start making reservations for the summer as early as May. 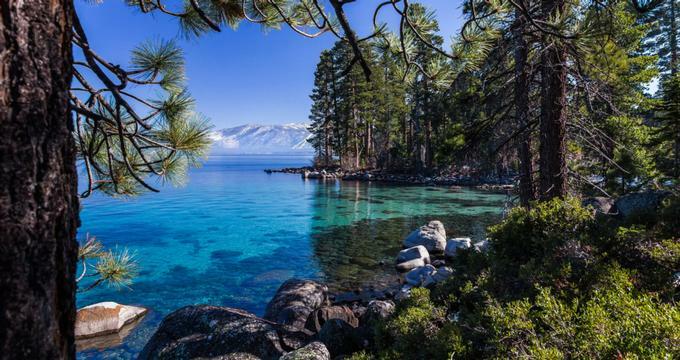 Part of the California state parks, Sugar Pine Point is located on lake Tahoe’s shores just 10 miles south of the City. The park has up to 100 campsites and it has restrooms as well as a dumpsite for RVs. It can have RVs that are up to 32 feet and trailers that are up to 26 feet long. If you bring a dog, make sure that it’s on a leash that’s not longer than six feet. They’re not allowed inside any buildings or unpaved trails. They’re also not allowed on the beach. Sugar Pine Point gets busy sometimes during the year, so you’ll want to make reservations in advance if you’re planning to go camping there. There are a couple more campsites out there, but these should be good enough to get you started. Remember, the best way to get information about these campsites and their reservation requirements is to go to their official website. Other than that, you just need to make a couple of preparations and you’re good to go.